Get In On The Ground Floor Of This Amazing New Social Media Traffic Powerhouse That's Set To 'Do A Google' And Become The Biggest Social Site On The Planet! Dear fellow internet marketer... remember the massive facelift FaceBook unveiled a a few months ago with the introduction of their TimeLine? So now you can 'pin' images and videos to your timeline. Does the expression 'pin images' ring any bells? It should, because there's every reason to think FaceBook went to all that trouble to introduce their 'pinable' Timeline because of the phenomenal growth of this new kid on the block - Pinterest. Just like Google did when it shot past established players like Yahoo, nearly a decade ago, Pinterest has come from a late start to take the social media world by storm and looks set to end up as the top dog. Pinterest is still new and yet it is already #3 in the social media top ten, overtaking other sites, such as LinkedIn and Google Plus. And, if it keeps up this momentum, it will eventually eclipse even FaceBook. So you are definitely all set for great Pinterest success, and here's why. So all you need to know now is how to use Pinterest and - more to the point - how to exploit its amazing growth to your maximum advantage. Once you possess this powerhouse of a program you'll gaze in wonder as your traffic stats soar skyward! This insider shortcut guide reveals every single piece of street-smart advice you need to maximize your clickthroughs and traffic from Pinterest. I'm sure you're smart enough to realize traffic is the rocket fuel that powers your business. And this exciting bag of tricks contains everything you need to know to become a Pinterest Wizard, within hours of receiving your copy of the training program. Just starting out and want to get visitors to your site in the shortest possible time to really get your business soaring skyward. Or you already have some traffic and profits and want to use the power of Pinterest to take your business to the next level. ... then you won't be disappointed with the sheer wealth of information in this package. This opening module gives you a good overview of what Pinterest is and how it can benefit you. How the rise of visual media makes Pinterest a natural place to explode your traffic gathering. The reason why folks use Pinterest and how you can use it to supercharge your business, profits and happiness. How Pinterest combines the best of both FaceBook and Twitter (what's more, you can even share your pins directly with your Twitter and FaceBook accounts). This module goes in deep to discover exactly why Pinterest is causing such a buzz among the internet marketing community. The awesome ability of Pinterest to generate leads for your business. Why "A picture is worth a thousand words" (and a great deal of traffic). The daily harvest of 1.5 MILLION visitors (who spend, on average, a full 16 minutes on the site). The vital way you can leverage the power of FaceBook and Twitter to increase the effectiveness of your Pinterest pins. The smart way Pinterest can explode the inbound links to your web site or blog site putting your search engine rankings on steroids! The sheer speed with which you can pin a post (no spending time revising and tweaking your post to fit into 140 characters like Twitter). The research that shows Pinterest is more effective than other social media sites at driving traffic to your site (it's actually three times better than YouTube). Now you have your mobile web site created, it's time to attract visitors like bees to honey. The important business of choosing a good user name. How to get a 'second chance' with your choice of user name. How to get some on the job training before you make your move. How there's no longer any need to get 'invited' to join - just go right ahead and sign up. The useful skill of navigating the Pinterest home page so you can use it to your best advantage. How to use your 'About' section to maximum advantage because you only have a limited number of characters. The vital art of structuring your pinboards and pins properly (and the perfect mix that works like gangbusters). How a good choice of user name will help you quickly connect with folks in your niche (so don't miss this vital point). How to maximize the marketing potential of your profile page (because this is the red hot core of your Pinterest marketing). This module covers the vital part of building a strong following to enhance your standing and so you'll be seen as the 'go to' expert in your niche. Why getting plenty of followers is vital for your success. How to get started and how to attract followers to follow you back. The two ways your followers can access your pins (and how they will know when you've pinned something new). Modern marketing has everything to do with drawing prospects to your site. And this module covers that aspect admirably. The vital key to getting the attention you deserve. Pinterest code, what it is and how to use it to make your site totally Pinterest-friendly. Why getting your website or blog Pinterest ready is a key part of your Pinterest marketing. How to ramp up your Pinterest interest (this is vital if your site is lacking the 'I factor', right now). How to put a Pinterest button on your site (this simple step alone will greatly enhance your Pinterest marketing). How to make it a complete no-brainer for your followers to pin your site and the several ways you can use to achieve this. As with all internet marketing, the search engines are never far from an astute marketer's thoughts. And the good news is Pinterest is awesome for helping you get good rankings. And this module gives you the heads up. How to model the success of other Pinteresters. The vital factor you must not forget (ignore this at your peril!). The very best source of images you can use and how to get hold of them. The one thing you must not look like (avoid this fatal error at all costs). The fatal mistake you must avoid at all costs (it's very easy to fall into this trap). The importance of getting your profile search engine friendly and how to do it the best way. Why adding links is an important part of your SEO and where to put your links for the best effect. The key to writing effective descriptions for your pins (and how it's never too late to improve them). How getting good search engine rankings for your pins will pay off in more traffic and business for your site. The vital nature of the correct keywords in every part of your Pinterest operation (and how to enjoy the best SEO results you can). The simple truth is that those with the best images and videos will rise to the top of the Pinterest tree. So here's the low down on becoming an expert pinner. The first rule of marketing (and it applies on Pinterest too). Harness the awesome power of video and get even more kudos for your self. The place where you should not get your images and what sort of images are best. How to keep ahead of the curve when it comes to trends and your popularity will soar. The silly mistake you need to avoid and how you can maximize your effectiveness with a little care. How to create compelling descriptions that light a fire under the viewer and electrify your SEO prospects. The art of the hashtag on Pinterest (you've seen it used on Twitter - now see how to exploit it on Pinterest). The central ethos of all the best pins (once you have these secrets, you'll be well on your way to great success). How to become the 'go to' guy or gal for your particular niche. How to showcase your business (and not be accused of spamming). How to boost your follower's egos and enhance your standing at the same time. The red hot video gallery (it's just like strapping on a booster rocket to your marketing). How to tap into the increasing mobile audience which more, it's easier than you might think. The street-smart technique to make your followers feel really special (yet it's drop dead easy to do). The little known secret of using pinboards to provide valuable social proof about you and your products. The easy as pie way to see how many times your website's been pinned (all it takes is a couple of clicks). There is a wealth of other money making opportunities available via Pinterest and the tips in this module will get your creative juices flowing. What to look for when choosing an affiliate product to promote. How to use the visual nature of Pinterest to promote your products. Where to locate good affiliate offers (these four places should net you plenty). The magic ratio you should observe when posting affiliate links (ignore this and you could be labelled a spammer). Like all social media sites, good etiquette has to be observed at all times. So here's the inside track to ensure you don't make any fatal blunders. If content is king, then this element is certainly the queen. What you must always do when posting an image that isn't yours. How less is often more and why it's important you keep well below this limit. The vital part a good description plays (and why you need to craft it carefully). The one thing you must guard against and how to check you aren't falling into a trap. What you need to avoid with your pinboards (failing to do this will annoy your visitors and leave a negative impression). The fatal mistake you must not make when taking photos from Google (fortunately, it's easy to avoid if you follow this tip). 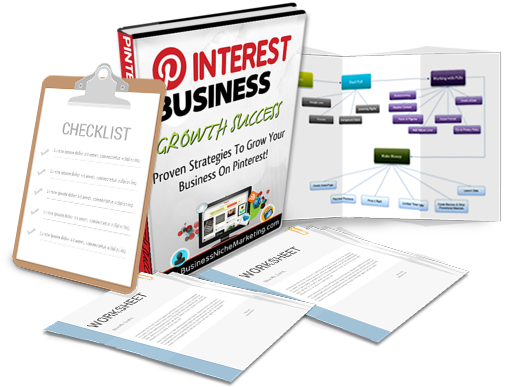 Pinterest Business Growth Success gives you a complete simple to use method for becoming a Pinterest Wizard, because once you posssess all these insider secrets you'll be awestruck at the speed with which your traffic and profits explode. Keeping track of all your pins, re-pins and pin boards is a snap with this convenient add on. 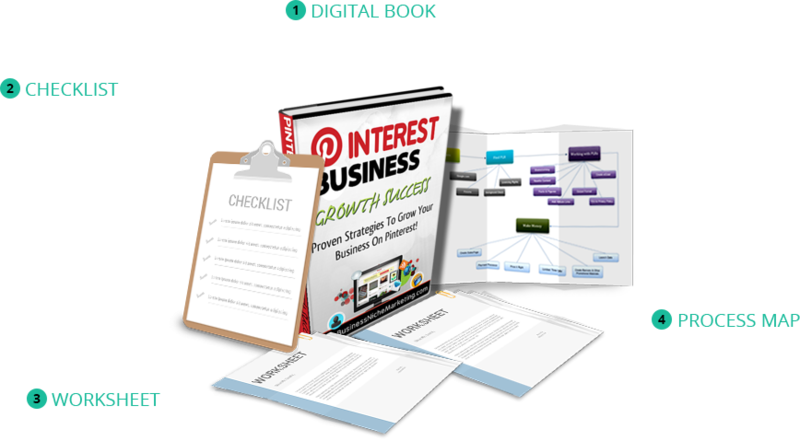 And, because it seamlessly integrates with the Pinterest Business Growth Success program, you'll be delighted when you discover what a useful aid it is. It will make creating and controlling your Pinterest marketing brain dead easy. All you need do is check off each item, as you finish it. This is a completely automatic way of keeping up to speed with your Pinterest marketing. Having every detail of your Pinterest project at your fingertips is the secret to quiet efficiency and maximum effect for minimum effort. 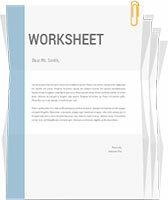 And this free checklist makes it a complete no-brainer to be certain you have all aspects covered. This checklist works in harmony with your Pinterest Business Growth Success program, so keeping track of everything is a slam dunk. Any doubts about your ability to handle this strange new world of Pinterest will disappear when you can see the entire process laid out before you in a simple 'paint-by-numbers' style. Fortune 500 and other top executives are taught to take 'helicopter views' of their business. This literally lets them see the BIG PICTURE. To make the maximum money from your business means maximizing the opportunities to sell more product. So it's vital you have an accurate overview of your Pinterest marketing at all times. But I've made it both effortless and enjoyable with this no-brainer innovation, of which I am justly proud. 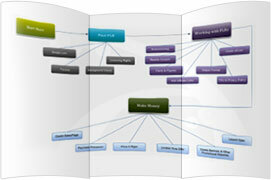 So simply print out this process map, put it on your wall and you'll be able to instantly see the complete picture. 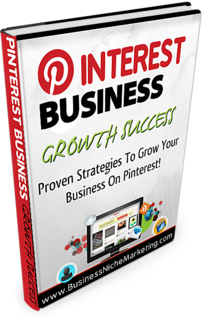 You can have this 66 pages book for free as an exclusive bonus when you buy the Pinterest Business Growth Success. Let there be no doubt - as soon as you've become a Pinterest Wizard the massive boost to your traffic will transform your sales, profits and happiness! For example, just imagine using Pinterest to pin compelling images of all sorts of enticing products. And, when your followers click through to Amazon it will be through your Amazon affiliate link. Have you yet to experience the buzz that comes from knowing you've left all your money worries behind for good? Just imagine no longer dreading the arrival of the mail man with all those bills. Because you can now pay them all without a second's thought. And just think of the sheer joy of being able to buy your loved ones luxury gifts without ever wondering if you should be saving the money for something more 'sensible'. Because that really is the sort of lifestyle you can unlock when you are a Pinterest Wizard. ... so your risk is ZERO. Yes! I'm going to allow you to test drive this full Pinterest marketing program, fully confident that - if, for any reason, you don't feel it's quite right for you - all you need do is let me know and your refund will be winging its way to you at the speed of light. I'm so sure that Pinterest Business Growth Success will provide you with the results that you're looking for that I'm willing to back it up for a full 60 days. You can rely on this... the program I have for you here will take both your income and life to a whole new level - and all you need do to make it happen is say YES! Because it's brimming full of battle-tested secrets with the power to take your marketing to the next level and so give your income a powerful jolt skywards. I guess you're smart enough to understand how these insider secrets will empower you and I bet you want to know what you need to invest in the Keys To The Profitable Kingdom Of Pinterest Marketing. This program is hot off the press and therefore includes nothing but the very latest, cutting-edge techniques for maximum Pinterest marketing success and profits. What's more, as you're just about to become one of the Early Birds who can exploit these powerful profit secrets to the maximum - you can forget having to invest $525. I want to become a Pinterest Wizard - sucking in far more traffic than from any of the other social media sites and with far less effort. I know with absolute conviction that, with the help of this program and my own imagination and ambition I can finally scale the heights of internet marketing achievement. I really do appreciate this golden opportunity to move up to a better life of financial freedom for myself and my loved ones. I understand that, as soon as I absorb Pinterest Business Growth Success and put these valuable secrets and techniques to work, I can quickly start to see the extra traffic, sales and profits that my Pinterest marketing will bring - but only if I take action and actually use the insider secrets I'll discover in this program. I'm grateful for your cast-iron 60 day guarantee, not that I expect to need it, because I'm determined to diligently follow every tip and trick in the Pinterest Business Growth Success program and I want to invest in my copy right now! Make the correct decision now and you will have taken a giant leap forward to that wonderful time when your wealth will be beyond your wildest dreams. That's when you'll look back to today when your eyes were opened to the awesome power of Pinterest and how simple it is to unleash a torrent of eager traffic onto your web site or blog with these quick and easy Pinterest secrets.. So I'm really looking forward to welcoming you on the other side, in a few moment's time, and then taking you by the hand and showing you exactly how these Pinterest marketing secrets can be truly life-changing. P.S. : My copper bottomed 60 day guarantee completely protects you. So there's no risk in this - unless you risk losing this golden opportunity by deciding to pass..
And, each time another smart marketer invests a tiny $47.00 in this powerful, life-changing program it moves ever closer to the moment when your chance to invest such a tiny amount will have DISAPPEARED FOR EVER. Why wait only to have to pay double, later?